Downloads still aren't translating to dollars for Google and developers who create applications for its Play store for Android devices, as Apple's iOS App Store remains far and away the most profitable digital storefront, according to the latest data. 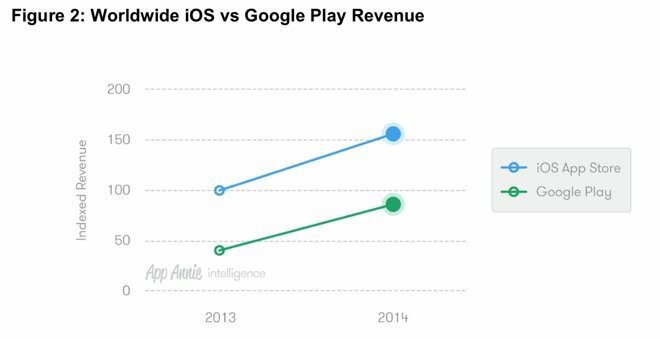 New figures from mobile analytics firm App Annie published on Wednesday show that in 2014, Google Play had 60 percent more worldwide application downloads than Apple's iOS. In terms of monetization, however, it's a very different story: The iOS App Store generated over 70 percent more yearly app revenue than the Google Play Store. That's not because Google Play revenue didn't grow last year, either. Both stores posted strong revenue growth in 2014, but Apple's growth was on pace with its competitor, allowing it to maintain a significant lead in terms of dollars spent. The new data comes after a record year for the App Store, in which developers generated over $10 billion in revenue. That's nearly half of the $25 billion developers have earned to date from the iOS App Store, showing that revenue is only accelerating on the digital storefront for iPhone and iPad. And 2015 is off to an even better start, as Apple revealed earlier this month that New Years Day was the single biggest day ever in App Store history. In addition, the first week of January set a new record for billings from the App Store, with customers spending nearly a half-billion dollars on apps and in-app purchases. 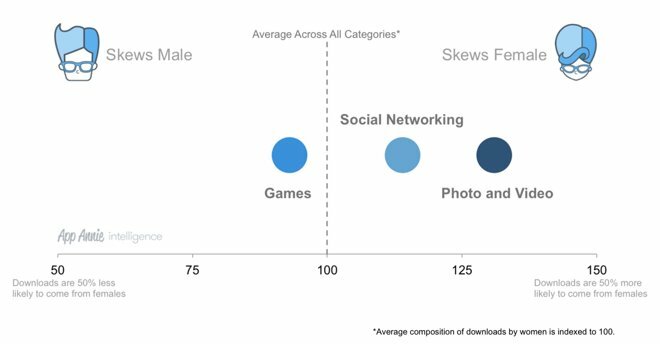 As for exactly what users are downloading, App Annie's data shows that mobile games generally skew toward male users, while females are more interested in social networking and photo and video apps. Most of the revenue on the iOS App Store and Google Play comes from a trio of nations that App Annie calls the "app store superpowers": Japan, South Korea, and the United States. Together, these three countries generated more revenue in 2014 than the rest of the world combined, the firm's data shows. App Annie's data comes from analytics featured in software from over 90 percent of the top 100 publishers, and more than 700,000 applications.